Perhaps the deepest journey of personal foresight is gaining better knowledge of our own personal traits, strengths, and weaknesses, and a more revealing understanding of our feelings, thinking and actions. Some aspects of our true selves are often seen better by loved ones, friends, and colleagues rather than ourselves, as we tend to hide aspects of ourselves that we don’t want to understand. All leadership starts with self-leadership, and self-leadership starts with self-knowledge, and overcoming damaging self-deceptions. The business book Leadership and Self-Deception (2nd Ed, 2010), is a very simple fictional story that discusses many ways we self-deceive, and techniques for battling our self-deceptive tendencies. It can be a very helpful first read for many of your clients. 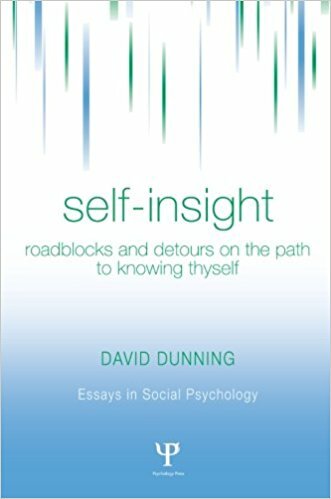 A deeper and even more rewarding read is David Dunning’s Self-Insight: Roadblocks and Detours on the Path to Knowing Thyself (2012). Dunning is the co-discoverer of the Dunning-Kruger effect, a classic cognitive bias where we mistakenly self-assess our cognitive or foresight ability as greater than it is, and/or imagine our expertise as being wider than it is. This is the problem of overdetermination that we have discussed as a personal practice challenge in valuing probabilistic foresight in Chapter 1. Overgeneralizing either our abilities or our areas of expertise can lead to some particularly bad foresight, as you might imagine. A certain amount of self-deceptions is adaptive. Shelly Taylor’s Positive Illusions: Creative Self-Deception and the Healthy Mind (1991) offers many examples of the value of “aspirational” self-deceptions. When you imagine yourself as stronger or more capable than you actually are, you can often more rapidly become what you aspire to be, as long as the self-deception isn’t too far removed from reality. The challenge is to keep that self-deception within reasonable, motivating limits, and to know just how far you can rely on your self-deceptive models. We also need to find and eliminate our unadaptive self-deceptions and self-limitations, as they are our greatest blocks to personal growth. Personal performance coach Tony Robbins offers some of the most useful tips for modifying our self-image and self-deceptions that I have yet discovered. For a great primer, read Robbins’ excellent self-improvement classic Awaken the Giant (Within) (1991) or if you are skeptical, watch Tony Robbins: I Am Not Your Guru (2016) on Netflix, to get a sense of the power and value of positive self-image construction. In Time Warped (2015), journalist Claudia Hammond discusses the psychology of time perception. Time slows down for us under fear or when we’re experiencing enduring discomfort or pain, like running a marathon, and it can fly by for us when we are on vacation, unless we take steps to be more aware of it. A chapter in her book, Remembering the Future, reminds us that our relation to the future is both a mental construct and a set of psychological choices. We can let our past, our present, or (our worries about) the future control us, or we can choose to continually learn from the past, to live and feel in the present, and construct achievable visions that allow us to expect great things from the future. Ultimately, your orientation to the future is a set of personal choices, so choose well. When we approach personal foresight from the framework of the Eight Skills, recall that Learning is the first step of the Do loop. Learning, which is about better hindsight and insight, requires an investigative mindset, and a willingness to challenge our current assumptions and beliefs about our history and current status. When was the last time you investigated yourself? Wrote an accurate, brief personal history of the various phases of your life to date, “warts and all”? Mark Freeman’s Hindsight: The Promise and Peril of Looking Backward (2009) offers one personal view of the use of hindsight to better understand our own true stories to date. Finally, knowing ourselves also requires good insight, an understanding of our current traits, strengths, weaknesses, skills, and resources. In section two of this chapter we’ll look at some good self-assessments that are worth taking, to grow your insight into who you presently are. Arguably the most important of the 147 Delphic Maxims. 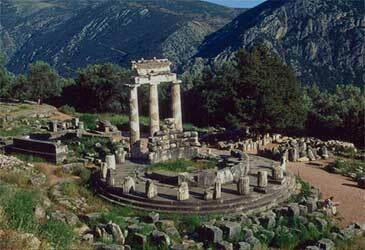 Inscribed above the door to the Temple of the Oracle of Delphi, the foresight center of Classical Greece, 1400 BCE to 395 CE. As one method to improve personal hindsight and insight, late psychologist Abraham Maslow, author of the hierarchy of needs, recommended peak experience summaries. These involve careful recollection and recording of brief examples of events or activities that have been peak insights and joys, and describing just what it was about each of those experiences that was so positive, for you. See Maslow’s The Farther Reaches of Human Nature (1971) for more on this method, and a retrospective on his other contributions. Hirokazu Koreeda’s film After Life (1998) in which individuals find themselves in a way station after death, having three days to sift through their life’s memories for the single one they are allowed to take with them to their next life, is a moving exploration of peak experiences. In creating the film, Koreeda interviewed five hundred ordinary Japanese with this question. The diversity of experiences each character chooses is fascinating, and personally revealing. Write out the ten most important (significant, impactful) memories (positive or negative experiences) from your life to date, that come immediately to mind right now. Write them out in the order in which they came into your mind, and keep going until you get ten. Now ask yourself some questions about your list. How many of these include loved ones? Life goals? How many of these experiences are negative rather than positive? As we’ll see later, a good ratio is probably to have two or more positive key memories for every negative or cautionary memory. Both are important for adaptive self-understanding. How many top experiences were shared with your loved ones? partner? How many are yours alone? As you think of these questions, more experiences will come to mind. Write those down too. Now write out an Aspirational Top Ten. What ten most important memories would you ideally have liked to come to mind, when you think of your life to date? What order would you like them to have entered your mind, from most important or foundational to less important? Do this exercise again at least once a year. New Year’s Week is a good time. One way to build a better Top Ten is to review your mental memories, trying to recall at least one from each year of your life after three to five years of age. Another is to review your diaries and writings. Another is to look back through family photos. Digital photo organizing and sharing services, like Google Photos, now help you use your cellphone to make digital versions of all your print photos, so you can more easily organize them in the cloud. What common themes do you see in the positive peak experiences on your Top Ten list? In a study of peak educational experiences for university students (Key educational experiences and self-discovery in higher education (2008)), psychologist Gad Yair found those experiences happened most often when the student was being academically challenged and was encouraged to use their new learning to explore (discover, imagine, and strategize) potential new elements of their personal identity. Exploration was maximized when students were told that they always had “second chances” to succeed after failure, and that practice to the point of failure is the best way to grow capability. This exploration-promoting perspective is called adopting a growth mindset (after Carol Dweck, Mindset, 2007), and we’ll discuss it later in this chapter. The foresight method of appreciative inquiry is another tool for peak experience summarizing. It involves identifying and mentally reliving a series of positive past and current achievements and abilities. It is sometimes used in the learning step (self-discovery) in organizations, especially when teams have become jaded, fear-bound, or pessimistic with respect to their future. Used well, inquiring into all the things that are going right, can quickly remove negative mental limitations that we have placed on ourselves, limitations that can often cause us to slip out of a growth and positive sum mindset and back into a fixed and zero sum mindset. That puts us in the best frame of mind for addressing what is going wrong. See Cooperrider and Whitney’s Appreciative Inquiry (2005) for a good introduction to the method. As each of us are motivated by both pleasure and pain, we need to mentally review and better define our peak fears, anxieties, and displeasures as well, however unpleasant that may be. Friedmann Schaub’s The Fear and Anxiety Solution (2012) explores how to uncover and confront the hidden fears and anxieties that self-sabotage our personal growth. Carter and Sokol’s He’s Scared, She’s Scared (1995) explores the hidden fears that we bring to our relationships, and how they limit our options. Goulston and Goldberg’s Get Out of Your Own Way (1996) has more tips on how to manage our personal fears and anxieties, and grow daily in spite of them. Honest regular learning reflection on the positive and negative motivators in our past and present will bring us a much better understanding of our current self, and it puts us in the best frame of mind for generating the most useful new goals. Perhaps even more than past achievements, reflection on failures presents us with the opportunity to learn and accept their unlearned lessons for our lives. We can then stop blaming our present self and others for our and their past actions, forgive, and move on. The sooner we get back on our horse after a fall, the sooner we can get back to leading our futures. Let’s look now at seven mindsets, or mental orientations, that seem particularly important to living a fulfilled and successful life.